The Winter Field Day Association (WFDA) sponsors the 2019 running of Winter Field Day, January 26 – 27. 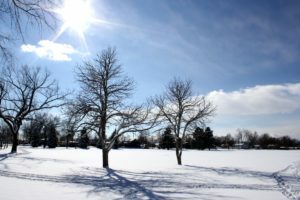 WFDA says that the ability to conduct emergency communication in a winter environment is just as important as the preparation and practice that take place each summer, but with some additional unique operational concerns. The Mid-Del Amateur Radio Club will be conducting its Winter Field Day Operations at Joe B. Barnes Regional Park in Midwest City. This event is open to the public. 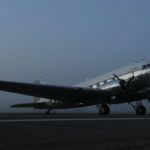 A majority of the C-47 were built in Oklahoma City at the Douglas aircraft manufacturing facility which is almost one-mile long and is still in use at Tinker AFB today. 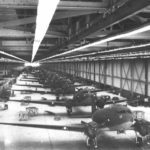 There were 5,231 C-47 and C-47As produced here and then put into service in all theaters to deliver cargo, supplies, paratroopers, and act as glider tow aircraft. 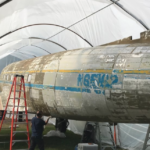 Additional maintenance, repair, and overhaul were conducted during the aircraft’s many years of service. If you are a Licensed Radio Amateur and wish to operate as W5S for the event CLICK HERE to register as an operator. After you register, please send Leah w3leo@w5mwc.org an email so she can enable your account. Operators must log each contact. The Oklahoma City Memorial Marathon was organized to be a Run To Remember for those who died, those who survived, and those whose lives were changed forever, in the bombing of the Murrah Federal Building in 1995. It is usually held on the last Sunday of April each year. This year that will be April 28, 2019. 100 amateur radio operators are needed each year to cover the entire course with Public Service Communications. We have operators shadowing the race director at the Start and Finish lines, operators at each of 4 relay locations, at each of 12 medical tents on the course, net controls for the whole race, SAG vehicle operation, water and ice trucks, an Incident Command trailer, in each of the SAG and water / ice vehicles, in the MASH medical tent at the finish line, in the lead vehicle for the full and half marathons , operators at the “kids corral at the end of the kids race, radio observers along the “last mile”, and operators at the Regional Emergency Operations Center in OKC, and any other assignments that may be needed. There is also a radio operator (with radio) running the race and acting as a course observer. Registration is on-line, and sign up today, to be a part of this amateur radio community event. Please be sure to use PSC19 as your registration code, which will assign you to the Public Services Communications team. The day usually begins at about 0600 with on-site check-in and most everyone should be back home (locally) by 1500 hours. It is a very rewarding experience, seeing and assisting with runners from all over the world. There is a Pre-Brief held within the last 2 weeks before the event where T-Shirts, credential packets (for those in the downtown area) frequency cards, and other necessary information is given out. Most radio operators, normally will need a good mobile/base unit with an external antenna (preferred), but an HT with an external antenna and spare battery packs or external power supply will also work, and as with all events be flexible and able to adapt to weather (hot, cold, rain, hail, wind, etc.) and to follow the communications plan set up for the Marathon by the Public Safety Communications Chairman. It is the main fundraiser supporting the Memorial Marathon Museum. It usually raises in the neighborhood of 1 million dollars each year. There have been around 24,000 to 25,000 plus entrants in all the races each year. The in-kind contribution of the Amateur Radio community is over $50,000+ in volunteer time and equipment each year. Sign up today and get in on the fun!